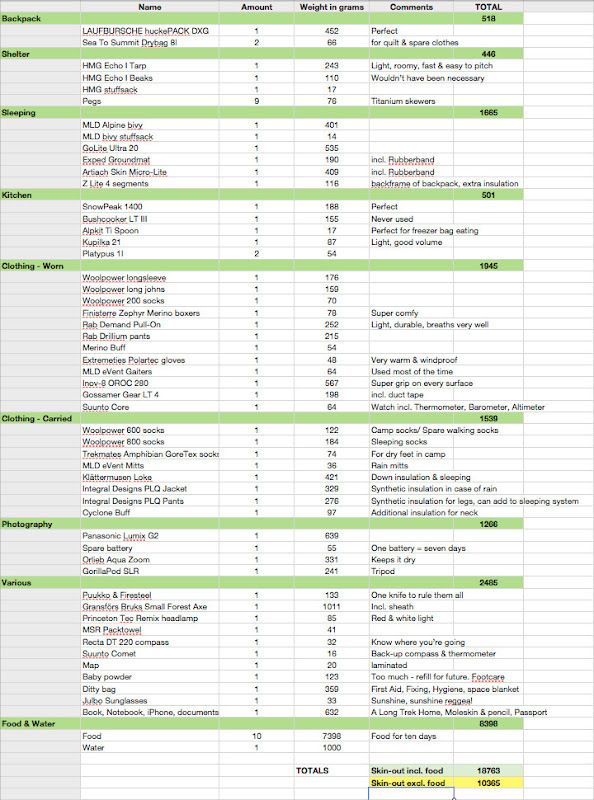 Plenty of old and trusted gear, mixed with some new gear, and also some mandatory and traditional pieces of gear, here's the packlist of my trip to Russia and my evaluation of it. Get ready for some Geartalk! As in previous discussions in the article here, I use Skin-out as the boundary. That puts me 365 g over the Lightweight limit, OMG! Backpack: A bigger version of the LAUFBURSCHE huckePACK, made from Dyneema X Grid. 49 l with up to 10 liters more, it was big enough to carry all my gear and ten days of food - comfortably! I had by far the smallest and most compact backpack, something I find, if walking off-trail in forests an enormous benefit - it means less whiplashes for the people behind me and less get tangled up in trees and shrubbery. Shelter: The Hyperlite Mountain Gear Echo I Tarp & Beak were my home at night in Russia. Light and roomy and giving plenty of protection for me and my gear, it was a great shelter which will see more use in the coming months. Theoretically I wouldn't have needed the shelter at all, as it didn't rain - but then I already brought it, and just using a bivy might have been too "extreme" in terms of me using other gear than the rest of the group and standing out even more wasn't necessary. Detailed review forthcoming. Sleeping: A MLD Alpine bivy with a Dyneema X Grid bottom and eVent 2L top, purchased from a BPL member, was the extra protection against wind and rain (well, moistness from underneath as it didn't rain). The decision for the MLD Alpine was made after reading how happy Dave was with his, as well as expecting more rain. The Exped Groundmat was a present from Jonas and I am glad I took it. The ground was moist and mossy at most campsites, so having a mat on which to lay out gear was welcome. That I love quilts should be well known to the regular reader by now, and my GoLite Ultra 20 performed well yet again and kept me nice and warm. The Artiach Skin Micro-Lite was a new try on how comfy and warm self inflating pads can be, and I wasn't disappointed. A more detailed review will come in the future. Kitchen: I carried the Bushcooker LT III as common gear for my food partner and me, but as we were able to make a fire each day it wasn't needed. The SnowPeak 1400 was perfect and will be my go-to pot for the coming months, offering plenty of space to melt snow and also to make bannock and pancakes. The Alpkit Lhoon is affordable and perfect for my type of cooking, and service from Alpkit is outstanding. A new drinking vessel is my Kupilka 21 kuksa, lighter than my wooden one and a bit bigger - just right for a cup of coffee or tea. A more detailed review on Kupilka crockery and cutlery is coming, so stay tuned. Clothing - Worn: Woolpower for underneath. Rab Drillium pants as usual - I expected rain, remember? - though I switched to a Rab Demand Pull-On this time around. Splendid smock, it breaths fantastic, is light and the one pocket is much more to my liking than two. Detailed Review forthcoming. Finisterre Zephyr Merino Boxer Shorts for that next-to-skin comfyness, warm, non-smelly, looks good. Wouldn't take anything else anymore when I go backpacking, be it one night or two weeks. Inov-8 OROC 280 on my feet, perfect grip on any surface and so much lighter and more comfortable than the rubber boots the rest was wearing. Detailed review forthcoming. SnowPeak 1400, Inov-8 OROC 280, Woolpower 200 socks. MLD gaiters = great, Suunto Core = detailed review in the future, but I can say that I liked it a lot (first watch I'm wearing in twenty years!) and also the GG LT4s were excellent. Only one member of the group used trekking poles, and while I myself am only a recent convert I found them very beneficial. On super swamp day they allowed me to probe the ground, on summit day they made the climb up and down simpler, and in the evening they were used to pitch my tarp. I think they're a good investment for people with joint and back problems, as they seem (so others tell me) to take some of the stress of them. More on them in detail as well. Clothing - Carried: Klättermusen Loke is awesome, detailed review coming after using it for over a year. The PLQ pants and pullover from Integral Designs were with me in case it would have got cold and also as wet weather insulation. I wore the PLQ pullover every day, the pants twice. If I would have known that it wouldn't rain I would not have taken either, as the Loke could have taken the duty. Extra socks were a recommendation, though taking both the 600 and 800 was overkill and the 600 would have been enough. The MLD eVent rain mitts I yet have to wear when it rains. It seems they're my good weather charm, and if I need to carry 36 g for it to stay dry then that ain't too bad, me thinks. The Cyclone Buff is excellent and was worn during the summit day, where it was so windy that if I would have jumped up in the air I likely would have flown a couple of meters with the wind! Trekmates GoreTex socks for camp, as usual. Photography: I carried a new test camera on this trip, sans spare battery - so all photos from this trip - nearly thousand - were taken with the Panasonic Lumix G2. I'll not lose much words on the camera now as I'll write a more detailed review on it in the future; though the photos already can give you an idea of it. Various: Puukko as my trusted knife & also a mandatory item. Recta DT 220 compass, used twice: On the day I was guiding and on the last night, because it is easy to get lost in the dark if you camp on top of a ridge! Gränsfors Bruks Small Forest Axe as mandatory group gear, a very nice axe which I used quite a few times. Sharp, well balanced and practical if you need to split wood for a fire or cut down a dead tree to make a pole for your tarp. Detailed Review forthcoming. Suunto Comet, my small compass & thermometer, always handy but with the Recta compass and my Suunto Core maybe not necessary anymore. Baby powder was a last minute buy for footcare, in order to keep feet in good health after walking through swamps. As I used only 11 g in nine days the whole package was unnecessarily big, need to refill it for future trips in appropriate portions. The iPhone was dead weight, and I also had not enough time to read so both book and phone could have stayed in the car. Princeton Tec Remix headlamp was just perfect for this time of the year, the red light is so much more comfortable on the eyes when walking in the dark as it doesn't kill the natural night vision of the human eye (white light does). Personal First Aid kit wasn't needed, also not the fixing stuff. Hygiene, I could have taken less soap (should have taken a Mini Dropper bottle! ), everything else was ok. Maybe I should have cut my toothbrush shorter to safe some extra weight?